The Erawan Shrine(Thai: ศาลพระพรหม, San Phra Phrom) is a Hindu shrine in Bangkok, Thailand, that houses a statue of Phra Phrom, the Thai representation of the Hindu creation god Brahma. 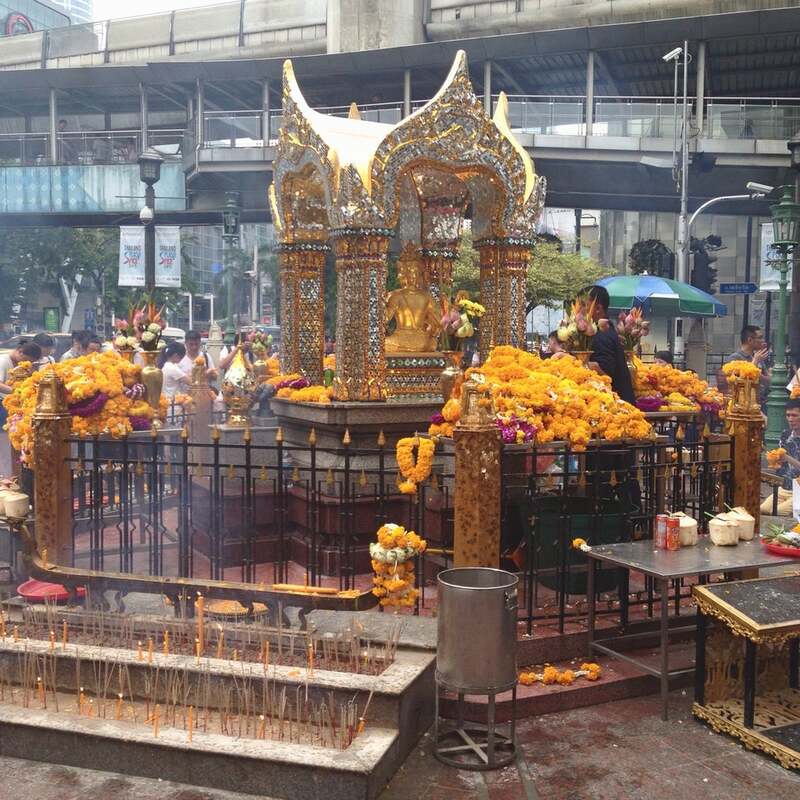 Why Erawan Shrine is special ? The Erawan Shrine (Thai: ศาลพระพรหม, San Phra Phrom) is a Hindu shrine in Bangkok, Thailand, that houses a statue of Phra Phrom, the Thai representation of the Hindu creation god Brahma. A popular tourist attraction, it often features performances by resident Thai dance troupes, who are hired by worshippers in return for seeing their prayers at the shrine answered. On 21 March 2006, a man vandalised the shrine and was killed by bystanders. However, two months after the incident a new Brahma statue was completed and placed in the shrine on 21 May 2006. The Erawan Shrine was built in 1956 to appease the supposed evil forces that were taking the lives of construction workers and causing other calamities in the construction what is now the Grand Hyatt Erawan. What to explore at Erawan Shrine? Visitors make ceremonial offerings from floral garlands, fruits to teak wood elephants in the hope that their wishes will be fulfilled. Judging from the flowing multitude of believers, for many those wishes were indeed granted. The area is crowded with worshippers day and night and always wafting with incense smoke. It is also common to see people bowing as they pass by bus, taxi or above by skytrain. To feel the aura of reverence while watching the joyful celebration of a graceful Thai Classical Dance troupe or a lively Chinese Lion Dance is an experience to be added to your many memories of exotic Bangkok. How to get to Erawan Shrine? 8. Take the first right onto Ploenchit Road. 9. 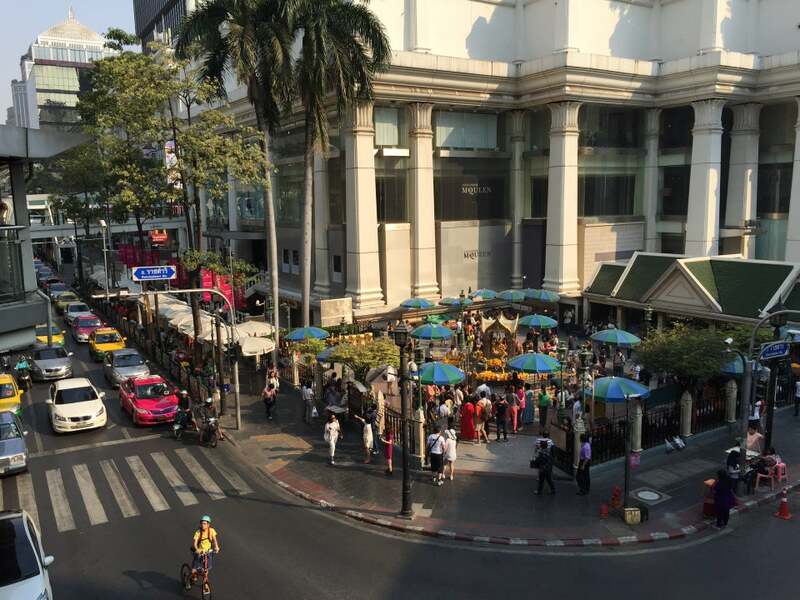 The temple is loacted nearby Grand Hyatt Erawan Hotel. If you want to buy flowers, joss sticks or candle buy inside as it is cheaper than outside stalls. You should bring suntan, hats and sun glass to save you health. You should bring your camera to caught the nice sightseeing of this temple. Best to visit either in the morning or evening when it isn't so hot. You should keep a clean environment in this public area. It is quite hot on midday so you should bring umbrella to avoid being sunburn. You should wear the polite clothes when visiting this reverent place. You should keep eyes on your children, the crowded street is front of this temple. You can visit the Grand Hyatt Erawan Hotel after praying. The Erawan Shrine was near my hotel so I decided to take an hour in the morning and walk over. The shrine itself is located right beside a Skytrain stop and is worth a visit if you are in the area. It is free to see and only takes a few minutes. Since it is a Hindu shrine it is nice to see something different from the Buddhist shrines in most of the rest of the area. If it was far out of your way I would not take the time to visit, but if you happen to be nearby or are looking for something free to see then it is interesting and worth your time.